Cross or Resurrection 3: What about Jesus' life? I also want to thank Tim for a comment on my post on the central message of the Bible, in which he pointed out an issue with how I have set up the series of which this post is the third part. I started the series by posing a binary question: which is determinative, the Cross or the Resurrection? But in fact there are other choices which could be made on the basis of the New Testament. The one which I dismissed in part 2 of this series, that the example of John the Baptist is normative, is hardly a Christian one. But, as Tim reminded me, it is a Christian position to take the life and teaching of Jesus Christ as the basis for Christian living. This is in some ways a third alternative to focusing on the Cross or on the Resurrection. It is one especially associated with the Anabaptist movement, as well as with the strand of Catholic spirituality associated with the classic book The Imitation of Christ by Thomas à Kempis. So in this post I will look at that alternative focus. I want to affirm strongly that the life of Jesus is a good and important example for Christian living today. This has been a consistent theme on this blog. Five years ago I wrote that Jesus is Our Fully Human Example. Three years ago I suggested, rather controversially perhaps, that the faith of Jesus Christ should be a model for our Christian faith. I would also affirm, against some dispensationalists, that the teaching of Jesus is directly relevant for Christians today. We are even expected to live according to the Sermon on the Mount – although there is grace for us when we fail. But this mention of grace illustrates the inadequacy of making the life of Jesus the centre of Christianity. Can we really be expected only to follow the teachings of the Great Teacher and to live as he lived? It is for good reason that many have concluded that the Sermon on the Mount was intended as an impossible standard to live by. It is indeed impossible if we try to live by it in our own strength, treating it as a new law to replace the one given through Moses. But the Sermon is surely intended as more than an unattainable standard given to force us to repentance. While some might just be able to live for a time in obedience to Jesus’ teaching, there are clearly ways in which no one can hope to do as he did in their own strength. Jesus was best known in his own time, and perhaps in ours, for the healings and other miracles which he performed. As I have argued before, he was able to do such things not because he was God but because after his baptism he was filled with the Holy Spirit. And he expected his followers to do not just similar works but also greater ones (John 14:12). That is clearly impossible for ordinary human beings without the power of God. Thus both the teaching and the miracles of Jesus point us beyond his life on earth. It is only through his death on the Cross that men and women can receive forgiveness, without which even a perfectly amended life is pointless as it cannot atone for past sins. It is only through his Resurrection that people can receive a new life with the ability to overcome evil and live according to Jesus’ teaching, even in the Sermon on the Mount. And it is only through Pentecost which followed them that anyone can receive the power of the Holy Spirit to perform the even greater works which God has prepared in advance for them to do (Ephesians 2:10). So we have to conclude that, important as the life and teaching of Jesus are for the Christian life, they are not its central focus. True Christians need to look beyond following his example and his instructions to what follows, which alone is able to effect achievements with eternal consequences. Continued in Cross or Resurrection 4: The Centrality of the Cross? * UPDATE: Tim tells me that all the significant posts from Anabaptist Anglican have been transferred to his main blog Faith, Folk and Charity, where they can be found in the April, May, June, and July 2007 archives. This entry was posted in Anabaptism and Pacifism, Christology and the Trinity, Resurrection by Peter Kirk. Bookmark the permalink. Thanks, Peter. It’s always a pleasure to recommend your blog to others as you always write such thought-provoking, gospel-centred articles. As far as this one goes, I approach the relationship between the atonement and the life and teach;ing of Jesus a little differently than you do. Yes, of course we are dependent on grace as the foundation for our Christian life, but we are also meant to build on that foundation. Look at it this way. Let’s say that the invitation to discipleship is an invitation to enrol in ‘The School of Jesus’. The Sermon on the Mount is not the entrance exam; it’s the curriculum, and we’ll be working on it for the rest of our lives. The Beatitudes tell us, however, that the entrance is free – whether you’re poor in spirit or pure in heart, mourning or hungering and thirsting for righteousness. In other words (to press the analogy a bit), the death and resurrection of Jesus are the means by which our school fees were paid as a free gift by the Principal, and they come with a guarantee of his personal help and support (the gift of the Spirit). We will of course be grateful to him for his gift and his help all through our time at the school. But we won’t be constantly focussing on those things. We’ll be focussing on getting to know him better, following his example and putting his teaching into practice in our lives. So in short, the good news is that everyone is welcome because of Jesus death and resurrection and the gift of the Holy Spirit. But what they are welcomed into is a life of discipleship, which means a life of learning to put the teaching and example of Jesus into practice. Thank you, Tim. I wouldn’t disagree with your school analogy. But of course enrolling in the school is only possible if the fees have been paid, which brings us back to the Cross. I would also insist, and I don’t think that you would disagree, that making any progress in the school depends on the Resurrection and on Pentecost. So I think we would disagree only on relative emphasis. I may come back to that issue of emphasis at the end of the series, suggesting that it is wrong to focus on any one or two of my three or four alternatives at the expense of others. I would, however, strongly disagree with the strand of liberal Christianity which suggests that it is only the life and teachings of Jesus that matter, that his death was little more than a tragedy, and perhaps that the Resurrection is a myth. I had not had cause to know much about Anabaptists. However a failry recent article in the “Reader” magazine touched on their particular emphases. And I suspect it is in emphases Christians will differ. 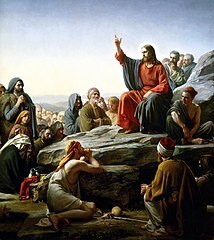 As I see it, in the life of Jesus on its own we have , among other things, an amazing and wonderful teacher and example. But what is totally different about Jesus lies in the facts of the Incarnation and the Death and Resurrection. If he had “just” died we might think “Oh dear another wonderful man upsets the authorities”. The Resurrection proves the value of his death as it were, and is the basis of the new life we are all to begin to enjoy. It assures us, along side Pentecost that we can start to live the life we are supposed to live, to do the things prepared for us, to draw on Eohesians. I share your thoughts on liberal emphasis you quote. I’m trying to express profound thigs succinctly, for once! Thank you, Colin. Yes, it is only the Resurrection which shows that Jesus was not just another teacher and wonder-worker who the Romans got rid of as a trouble-maker. But you are anticipating my expected conclusions. And the Resurrection is also fundamental to another Anabaptist emphasis about the Cross, which is that the cross is what happens to Jesus because of his faithfulness to God, and yet he does not respond with vengeance or violence but with love and forgiveness. And because of this, God vindicates him by raising him from the dead, thus proving that love is indeed stronger than death. Anabaptists would say that we also are called to follow Jesus in being willing to love our enemies and even die at their hands, in the confidence that God will vindicate us by raising us with Jesus at the last day. Tim, thank you for that helpful Anabaptist insight, which I would suggest is part but not the whole of the significance of the Cross. Are there really dispensationalists who say that the teaching of Jesus is not directly relevant for Christians today? I’ve long thought they were odd, but surely not that odd? Yes – Anabaptism today desn’t speak with one voice about the Cross. But I found that insight helpful in terms of keeping Cross and Resurrection together, whereas in some other theologies they seem to be only tenuously related. See also this paper from the dispensationalist site bible.org, which seems to suggest, in the Chapter 4 section, that “relegating the demands of the Sermon to a future age” was the teaching of an older generation of Dispensationalists but has been abandoned since the 1960s. Thank you, Tim. I suspect that many Anabaptists today have become rather legalistic, especially the ones who reject modern customs. But I am sure that others do keep a good balance between the life, death and Resurrection of Jesus. I realise that there is another more contemporary strand of imitators of Jesus, in the “What would Jesus do?” movement with their WWJD bracelets. I guess we see the same danger there: it is fine if kept in the light of the Cross and Resurrection, but dangerous if it just becomes a set of rules to follow.